Last week Samantha Verant blogged about bullying and the trouble the makers of the documentary 'Bully' are having getting a PG-13 rating. They need that rating so that it can be shown in American schools where it will do the most good, but the MPAA who dishes out the ratings are holding out on their 'R' rating because of the bad language. Anyone with an ounce of common sense will wonder why the MPAA is being so obtuse, and if they wish, can sign the petition which aims to urge them to change the rating. To sign the petition, click: STOP BULLY FROM BEING BULLIED TODAY! In one of those coincidences that are unimportant but take you by surprise anyway, my son came home from school the same week with a little pamphlet on bullying. French schools are no less immune from this behaviour than anywhere else although I wouldn't be surprised one day if I saw that some bright English/American spark had written a book entitled 'French Kids Don't Bully'. My eldest son was bullied a bit in the private Catholic school I sent him to in an attempt to get him away from sources of trouble at the local collège. The irony was not lost on me. Nor was the fact that he was bullied by a bunch of Algerian-origin boys from what passes in Montpellier as an immigrant ghetto because of his name. He told me about the matter but wouldn't let me interfere. He said he would deal with it. And he did. One day he flattened the leader and that was that. My youngest son went through a brief period when he was being ignored by the turd he considered his supposed best mate. Then it all sorted itself out, but he still considers Turd a pain in the arse, and rightly so. Bullying comes in different forms, but it's all painful to experience. The UK has a number of websites that support victims and provide help. They have names like Bullying.co.uk, BeatBullying.org, and so on. The official French website is somewhat less snappily named: AgirContreLeHarcelementAlEcole.gouv.fr because it appears there's no specific word for bullying in French. Harcèlement is basically harassment, a far less emotive term which has a vast range of meanings. 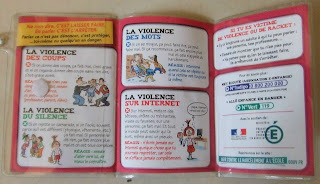 Still, the government seems to be serious about tackling bullying specifically - le harcèlement à l'école - by setting up the website and handing out the little pamphlets to every child in CM1 and CM2. 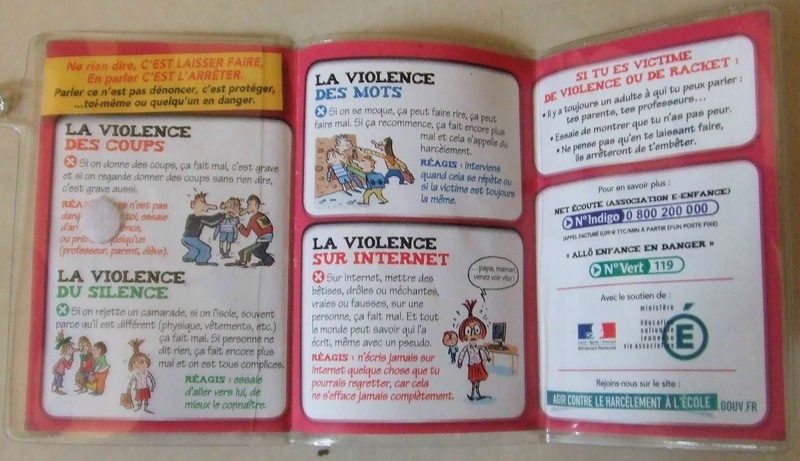 The pamphlets are sponsored by Max et Lili, two cartoon characters from children's books, and identify what constitutes bullying: punching someone, sending someone to Coventry, taunting someone with words, or being nasty about someone online. It tells kids what to do if they are the victim of bullying or a racket and lists a couple of important helpline numbers. one about spreading rumours and one about physical bullying. From what I remember about my days at school, they hit the nail right on the head, what with identifying bitchy girls sniggering, big lads pushing a smaller geeky kid around, and, a new one for the modern age, cyber-bullying through pictures on Facebook of a kid who's different, in this case fat. Finally, here's a link in English by Pointman for excellent information on internet security and how to help kids avoid becoming the victim of a predator.